We’re in Shanghai at the moment, and we’ve had another near miss with my cousin Sam Forrest, we had a close encounter with him in New Zealand, but we were on opposite sides of the North Island. Architecturally this is the most interesting city in China, because of it’s mixture of Ultramodern and Deco styles. There’s also a huge influence on the city from Europe. It’s narrow winding roads are one of the many signs of European influence on the City. Nicknamed “Paris of the East” and “Whore of the Orient”. It gives you an idea of what Westerners and Asians thought of the place. 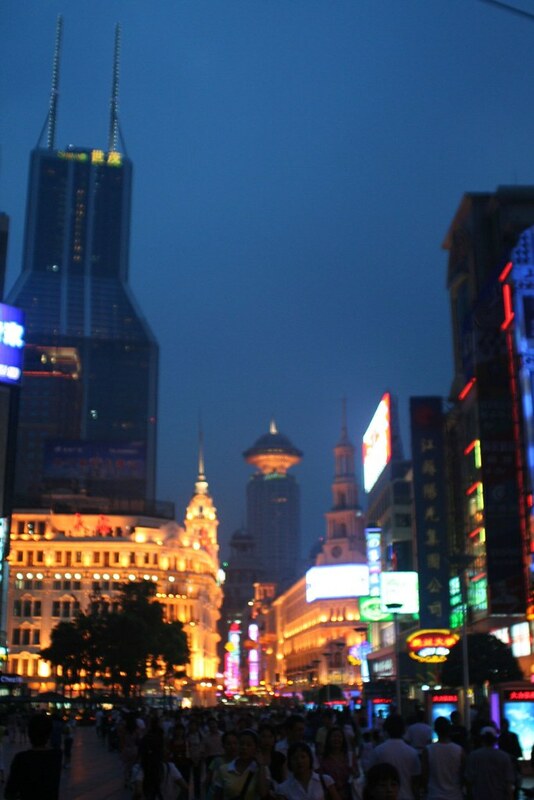 It would have been much more pleasant to visit Shanghai during the Spring or Fall – Summers here are too hot. Shanghai is home to China’s “Golden Mile” and some of the alleged best shopping in China. In reality, there isn’t a whole lot else to do here and it’s so steamy hot that you’re actually thankful to find an air conditioned mall on every corner. So in addition to strolling along the Bund, people watching down Nanjing Lu, and absorbing a little of the French Concession, we did manage to take in one historic site – the site of the 1st National Congress of the CCP. This was the site, 86 years ago today, of the secret meeting of 13 delegates who founded a formal and unified Communist Party of China. The museum was pretty interesting and a reminder that the CCP today is not the party of yesterday. Seriously. After an hour’s worth of reading exhibits about defeating the “bourgeois” you can step outside directly into one of Shanghai’s premiere shopping districts, something akin to the new outdoor urban malls of the US. If China is nothing else, it is ironic. Party history aside, we could live without Shanghai. If you love cities and shopping, then perhaps it should make your China itinerary. But it if you’re more interested in really getting to know China and seeing it’s magnificent scenery, give it a pass.